The Short Version: I think it’s worth $25 if you can find it at half-price. It’s not very useful for much more than basic balancing of a checking account. To import from Quicken 2006 you must install the new version and import from Quicken 2006 prior to installing Lion (or by booting into Snow Leopard). It works well enough for my needs. I’ve enjoyed using Quicken 2006 for Mac for several years. My financial tracking needs are relatively simple though it had more than enough features. Unfortunately, Intuit chose to not provide an Intel binary for the program. While I can understand why a company wouldn’t port an older program, I don’t understand why Intuit didn’t develop a version with equivalent features that is compatible with Lion. I debated whether or not to move to Quicken Essentials. I needed a financial program that is compatible with Lion. However, many of the reviews were very negative. In fact, the number (and weight) of the negative reviews made me very wary about buying it. Weeding through the reviews I found several individuals that stated it worked just fine if you only need to balance a checkbook. In the end I decided to go ahead and purchase it. While I do have a couple of investment accounts and various credit accounts it wasn’t essential that I track them in Quicken (I wasn’t doing this anyway, at the time). If you’re considering upgrading then I think I can safely state that it works just fine for tracking a checking account. If you’re interested in managing credit accounts, investment accounts, printing checks, integrating with TurboTax and a number of other activities then this product probably isn’t something you’ll want. There was one other thing that made the decision acceptable – I found a discount so I only had to pay $25. Unfortunately, it looks like the link to the discount is no longer good – the link now goes to a page that shows only the regular price. 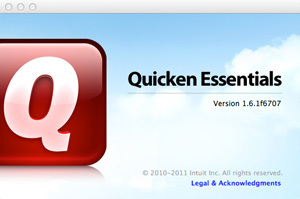 Warning:If you’re interested in Quicken Essentials because you plan to upgrade to Lion then you must install Quicken Essentials and import your data before you upgrade to Lion. My father ran into this problem but was able to make it work by booting into Snow Leopard.